Continuing the story of the hall closet from part one, we fast forward seven days for the pictures you see below. In this period I spent more time with a cold chisel, a five-pound hammer and curse words than any other time in my life. Brick chimneys can either be easy but heavy work if their mortar is old and in bad shape or arm numbing, extra heavy and extremely frustrating work if they are built like a tank. Ours had sections of both. I knew it was likely to not be a fun job especially since I couldn’t just toss the bricks to the ground but had to load them into a five-gallon bucket and carry them down a ladder and outside. Luckily since I’d done this sort of thing before, I recruited two other people to help me. When the house had been reroofed, the previous owner wisely had this chimney knocked down below the roofline so I didn’t have to worry about a patch. My goal the day that I had my helpers was to get the chimney down below the ceiling of the closet so future work would be from floor level. That took the better part of a morning. The remainder of the week I worked on my own removing the rest of the chimney and patching the floor. The floor required some thinking on my part as there were many finishing options. The existing tile sat in a several inch thick bed of concrete (I would guess as a fire resistant solution). At first I thought I’d try to remove the tile and replace it with something more attractive, but after working on it for a while I realized it was very well adhered. I didn’t want to replace everything with wood flooring as I actually like the surprise of the tile upon entering the hall. It also indicates the turn that takes place at that corner which is pretty neat too. 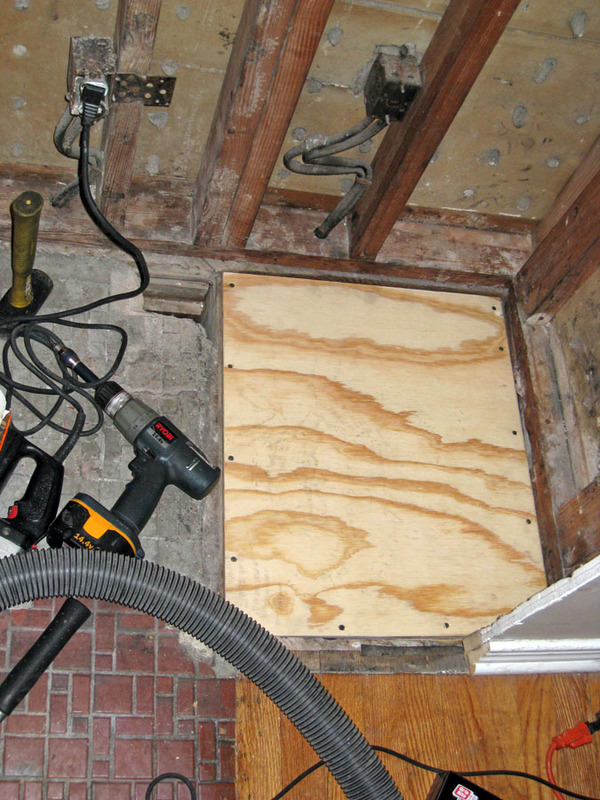 Since I knew that I would be covering the entire floor of the closet with a lower cabinet, I opted to plug the hole with some ¾” plywood level with the rest of the floor. Three other things of note happened during this phase. At the time our white cat was still alive and curious as ever, but that isn’t my first point. While still working in the attic, I managed to drop my chisel down inside the chimney. Annoyed, I had to stop work, get somewhat cleaned up and go buy another one. The second one I attached to my wrist with a slipknotted string. So point one: secure your tools when working on a chimney. Point two came into play once the chimney dropped below the tee where the old furnace connected to it. You see this was an oil-fired furnace (the first I’d dealt with). It had no cleanout which meant it contained about 60 years of sediment in its base. You might begin to imagine how this train wreck would unfold. As I worked my way down to ground level, black soot began to fall out of the chimney. I had put plastic floor to ceiling in the immediate area and had turned off the A/C. What I was unable to realize at the time was just how much of a cloud I was creating. Everything always looked cloudy through my sooty safety glasses so I just pressed on trying to get the nasty work done as quickly as possible. I knew I was in real trouble when three things happened. The first was when I tried to wipe the soot off me. It turned into a greasy smear. Hey, this stuff isn’t like regular chimney ash at all. The second (safety glasses removed): Hey, I’ve created a nice little angry atmosphere in here. There is a lot more soot in the air than I first thought. The third was when Melanie got home that evening and she gently let me know that black soot was everywhere in the house. That stuff got on EVERYTHING – every surface including ceilings, floors, books, doors, pictures – everything. It was a real pain to clean off too. Luckily our extremely good and generous friend was back again the next weekend to help us clean. I worked on it the remainder of the week and it still took the three of us all day Saturday to finish. Horrible! 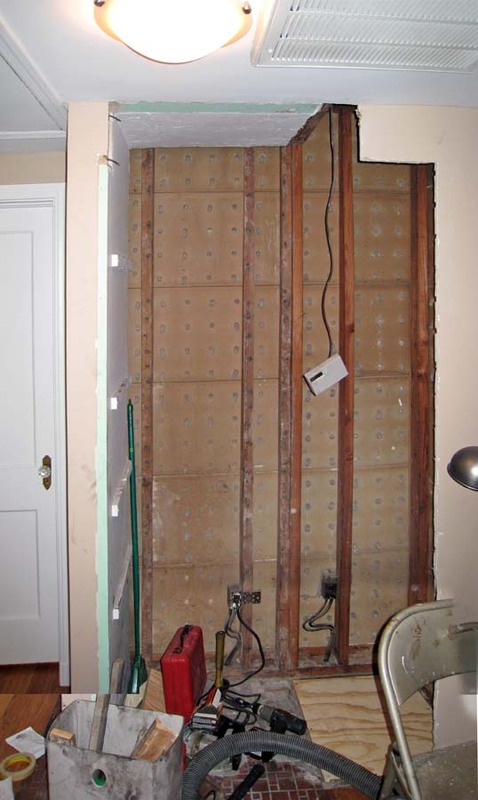 Also, during this phase I ripped out the back wall, the non-structural header for the doorway and took out a carefully measured chunk of the front wall to accommodate new larger doors. Next time we start putting things back together. For now enjoy the mostly soot-free pictures below (although you can see signs of the nightmare on my tools and the grey garbage can). Notice the Evil Black Fith on the Garbage Can – Grrrr! ok, so when was this done, and what happened to the cat? I’m feeling a hole in the story. “A hole” in the story? Groan… I did the project in 2008. The cat was fine she just had to be cleaned which she hated and we couldn’t get it all off of her.